Big Finish’s latest trilogy takes another brave but risky gamble in bringing back Tracey Childs’s Nazi-sympathizing Elizabeth Klein and inserting her into the companion role alongside Sylvester McCoy’s Seventh Doctor. In a trusted base-under-siege story, the fascinating backdrop of the Mau Mau uprising in 1950s Kenya and the extremely mysterious and unknown alien threat which confronts the characters help to make this experiment a wholly successful one. It’s been a surprisingly long time since Klein was introduced in Steve Lyons’s ‘Colditz’ in October 2001, but that script tantalizingly left her fate and her unique threat open. With the Seventh Doctor one to not suffer loose ends, the resultant personal and moral drama of these polar opposite characters is unquestionably the highlight of the release. ‘A Thousand Tiny Wings’ brings the two characters together very cleverly, and neither character goes to any great length to hide the mutual loathing present from beginning to end. While there is some interesting discussion about what sets these two characters apart as well as what makes them chillingly similar, the Doctor never once considers that he should defeat Klein or lead her to her death. She is a person out of time and, despite their differences, he simply wants to ensure he minimizes her potential to alter history in any meaningful way by educating her as best as he can. Even without considering her origins from a timeline in which the Third Reich emerged victorious, Elizabeth Klein is a completely different kind of threat than any other the Doctor has faced in his many lives. She’s not overwhelmingly powerful by herself and she certainly does not match the Doctor’s intelligence, but she is intensely brilliant in her own right and continually laces her malice with deceitful logic that trips up and confuses even the Doctor, emerging victorious more than once. Even as the two argue about seemingly innocuous subjects, she remains ever astute about her surroundings, expressing a distrust of someone the Doctor gives the benefit of the doubt to that ultimately ends up being justified and offering a brutal assessment of the Doctor’s willingness to manipulate others into life-threatening situations. The stellar sound designs and performances bring the enthralling and very claustrophobic Kenyan jungle to life admirably, and Ann Bell in particular deserves credit for her brilliant performance as the venerable colonial Mrs O’Donnell who seems to revel in murky shades of grey and old-fashioned beliefs. While the ultimate outcome of the Doctor deciding to take Klein aboard the TARDIS in order to show her the wonders of the universe while at the same time stymying her potential for evil may not be surprising in the least, her undoubted schemes and machinations to the contrary as well as the Doctor’s countering moves should be an immensely intriguing act to follow in the two upcoming releases. 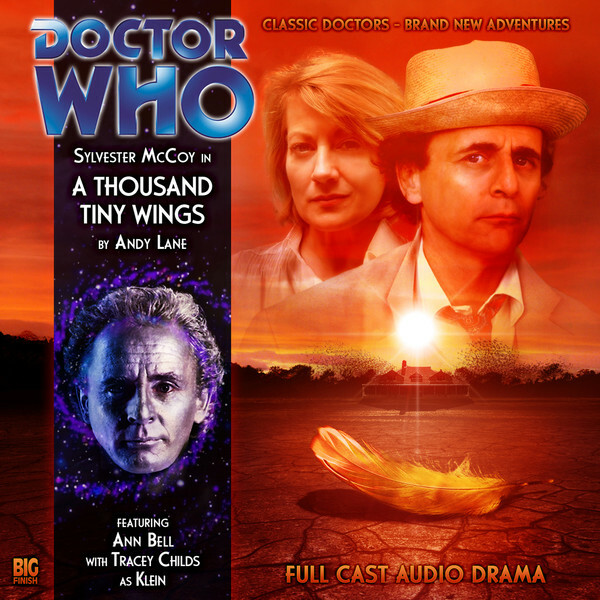 Rarely does a companion bring so much inherent potential for drama to the table, but the philosophical showcase for Klein that ‘A Thousand Tiny Wings’ provides is certainly a strong starting point.